The products featured in this post were given to me by Island Batik, Hobbs, and AccuQuilt. Hello! 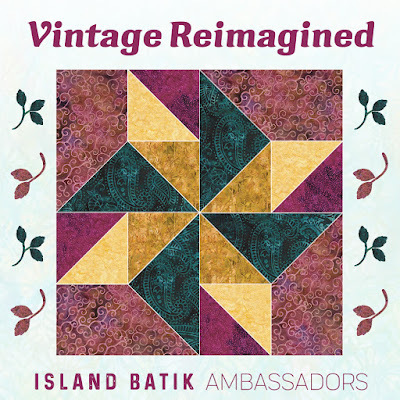 For March, the Island Batik Ambassadors challenge is "Vintage Reimagined." "Do you have a beloved quilt from a great grandmother, a thrifted vintage find or a memory of a quilt that you adore? Take something from the past and give it a personal touch that is yours. Inspiration can come from anywhere!" 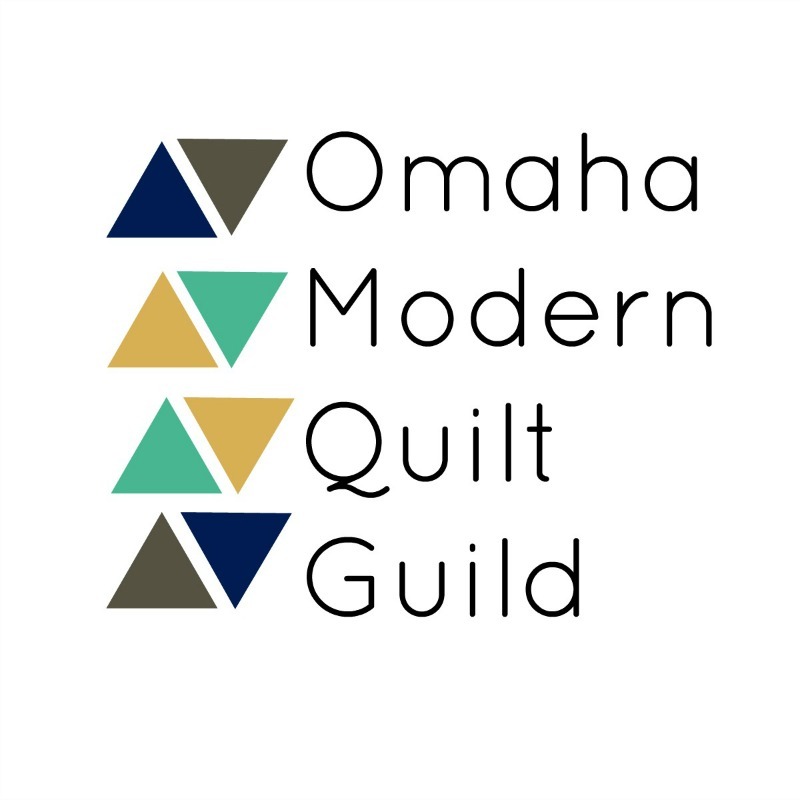 In December 2018, the Omaha Modern Quilt Guild spent an afternoon at the General Crook House Museum sharing our love of quilting with museum visitors. There were many quilting activities during the month in conjunction with "Quilts: Stitches of History" events. I took a few minutes to tour the museum and see all of the beautiful vintage quilts. I was intrigued by the display of crazy quilts and added a crazy quilt to my ever-growing list of quilts to make. I didn't know much about the history of crazy quilts and found some great information on the International Quilt Study Center and Museum website. After reading about the different types of crazy quilts, I determined I fit in to the rural/small town-type of crazy quilt maker. "But in parts of the country that were less concerned with national fashions, such as in rural areas and small towns, the Crazy quilt continued to be a favored style. In these areas, however, whether by necessity, preference or sensibility, Crazy quilts were most often made from workaday fibers like wool, cotton, and wool/cotton mixes, rather than the luxurious silks of the high-style versions. In these three “vernacular” -- or everyday -- quilts, fine silks, velvets, brocades, lavish embellishment, and smallish size have given way to cotton and wool of the type used for work and durable clothing. They also feature spare or no embellishment, and strength and size improved enough to be used regularly as warm bedcoverings. Far from sedate, the saturated hues of the wool fabrics and the soft luster of the cotton fabrics lend a pleasing richness and an air of simplicity." I decided to make a variation of a crazy quilt using leftover scraps from the Spirit Rhythm collection. I had various strips, rectangles, and squares leftover after making this quilt. In keeping with the "use it up" mentality of days past, I used the pieces as they were. 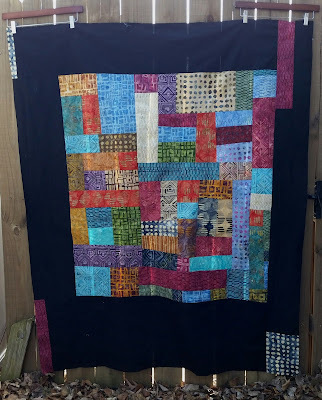 I had never tried hand sewing a patchwork piece before and rather enjoyed stitching my scraps together by hand and trimming up my patchwork pieces with scissors. When I had a decent-sized patchwork piece, I famed it out with some black Island Batik fabric to give it a more modern look. Oooh I like it. So rich and creamy. This was a great choice to show off all those yummy fabrics!